Heat oven to 400°F. Place pie crust in 9-inch glass pie plate. Arrange half the peppers in pie plate. In small bowl, beat milk, eggs and spreadable cheese with electric mixer at low speed until well blended. 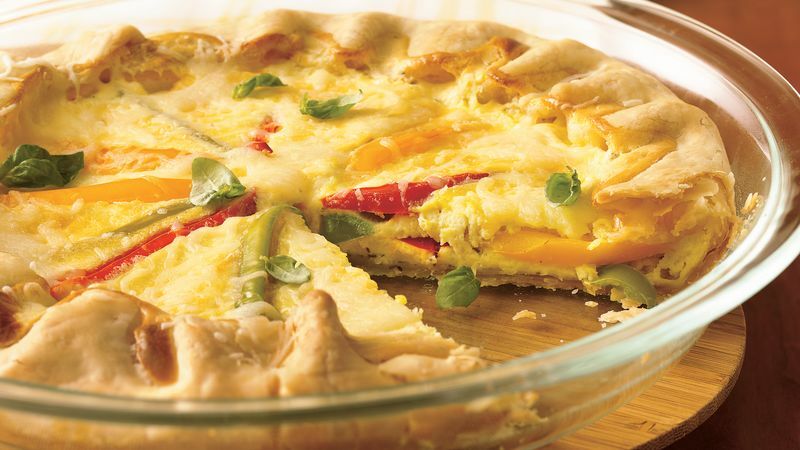 Pour egg mixture over peppers in pie plate. Place remaining peppers over top of egg mixture. Fold edge of crust over filling, pleating crust slightly as necessary. Bake 20 to 30 minutes or until crust is golden brown and center is set. Sprinkle with cheese blend. Bake 3 to 5 minutes longer or until cheese is melted. Sprinkle with basil. Serve immediately. You can use bell peppers of just one color, if you like. Like spice? Chop up a jalapeño chile, and add it to the filling.